1 March - Things remain strangely quiet in the ponds. Frog numbers are now up to around 90, but there seems to be very little urgency to get on and mate. Very little spawn has been added since my last report despite the weather having been quite mild. The forecast is for some cold nights again in the first part of next week, so we may have to wait a little longer for the main spawning to take place. 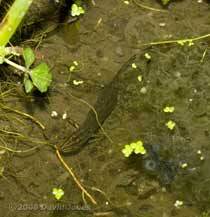 3 March - The quiet spawning season goes on, although the shallow end of the pond is now becoming filled with spawn. However, it has not been a good year for photographs so far, with the frogs still diving for cover whenever I go near the pond. Tonight, with the temperature down below 3C by 10pm there is not a single frog in the spawning area, and I can only see three at the surface over the rest of the pond(s). 4 March - There was a frosty start, with the temperature dipping down briefly to a couple of degrees below freezing. The day was bright. However, even though the temperature got up to around 8C by the afternoon there was hardly a frog to be seen, certainly none amongst the spawn. Tonight the forecast is for colder, perhaps -4C so I don't expect to see fresh spawn tomorrow morning. 5 March - We had the forecast sub-zero temperatures for a few hours last night, enough to produce ice cover over much of the big pond. By lunchtime it had warmed up to around 9C, staying that way until this evening when it has dropped just a couple of degrees under cloudy skies. Perhaps it was because that very cold night, but the pond has been silent all day, and I have only seen one frog at the surface - not even the splashes of frogs diving for cover as I approached. 7 March - I haven't been able to spend time by the ponds today, but after a mild night the big pond was once again alive to the sounds and splashes of the frogs today. Perhaps I'll get the chance to check on them tomorrow. 11 March - Well, we have had more frog activity in the ponds over the last few days, but no new spawn to report on, so it seems that spawning is over, with the last being produced on or about the 3rd. This has not been a good spawning year for the frogs. While at first glance it may seen that there is quite a bit of spawn, it is certainly far less than the last few years. The frogs just haven't had a settled period of ideal weather conditions. Usually, once they 'get going' I can approach very close to them (as previous years' photographs indicate) but this time it was almost impossible to approach the pond without them diving for cover, however slowly I moved. One good thing about the heavy rain we had yesterday was that it gave me a chance to skim off some of the duckweed from the big pond, giving me a better chance of spotting the newts when they start their breeding. There have only been occasional sighting of them so far, but I would hope to see more as they arrive in time to feed of the newly emerged tadpoles. 12 March - Just to prove me wrong, another clump of spawn appeared over night. However, there is just no sight of frog activity this morning, perhaps down to the high winds we are experiencing today. I was looking at the new spawn when I spotted a small beetle seemingly in trouble amongst the older spawn. Thinking that it had been blown in by the wind I rescued it and put it onto a log to dry out while I collected my camera. It was only when I looked at the images afterwards that I realised that it is (I think) an aquatic beetle - it looks very much like Hydobius fuscipes. This is a species that is often abundant in still water. 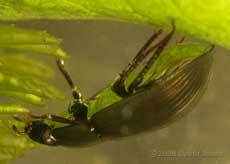 It is one of a group of aquatic beetles that does not have legs modified for swimming. Once I realised my mistake, I transferred the beetle to my mini-aquarium, and this is it a couple of hours later, complete with its own air supply (reflecting the green of the leaf above it) as it crawls amongst the plants. My insect guide describes Hydobius fuscipes as being 'shiny black with blue or green iridescence' (Chinery -Insects of Britain and Western Europe) but photographed under water (using flash) this individual takes on much more of a copper coloured iridescence. In another guide I was interested to read that in this group of beetles, the palps (seen in this picture) are enlarged and carry out the functions that are normally done by the antennae, which are somewhat reduced. 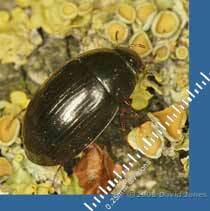 I hope to try and take some photographs when the beetle goes to the surface to breathe. 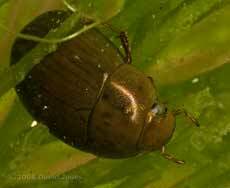 It seems that unlike most water beetles they arrive at the surface head first, poking one of their hairy antennae out through the surface film. The water repellent hairs form a continuous link form the antennae down to the air pockets (as well as the 'bubble' shown in the photographs, the beetle also stores more air hidden under its elytra). I wonder if I can be patient enough to wait long enough to time how long it can stay under water between breaths! 15 March - In the last two days just one more small clump of spawn has appeared. 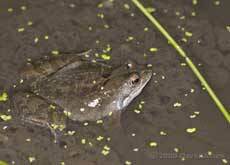 The frogs are still numerous in the ponds, and this evening there was an enthusiastic croaking coming from the big pond earlier that evening. Unfortunately it is raining quite heavily so there is no chance that I will be taking a camera outside tonight. It seems that tomorrow is likely to be wet, and we are likely to get a few cold nights again in the next few days, but I hope that they will be accompanied by dry weather as I try to get some photographs of the Smooth Newts that are gathering now in the ponds. This picture was taken two nights ago in an area of the pond right next to the developing frog spawn. I hope to get some interesting shots once the tadpoles emerge and the newts start their annual feast. 17 March - Last night I went newt spotting in a big way. It's a case of many thanks to Steve Langham of the Surrey Amphibian and Reptile Group (SARG) who took me on a late night walk to see Great Crested and Palmate Newts for the very first time. Despite a touch of dampness and a cold wind, we were successful, and I returned home very tired, very pleased, and very grateful to Steve for the opportunity! I was surprised just how big the Great Crested Newts are. I knew that they are quiet a bit larger than the Smooth Newts but I hadn't realised just how big they would be - I think I would need a much bigger pond to keep them happy (and they would be partial to a Smooth Newt for supper!). Back in my pond I would expect to see frogspawn giving up its contents by now, but I have yet to spot tadpoles that have emerged. When I looked earlier today, much of the spawn seemed to be in a similar state to that shown here. 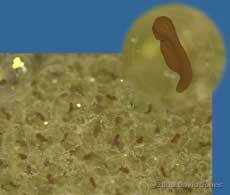 Most of the spawn looks healthy, but there is one clump that is not going to succeed. As you can see, the eggs have turned white as they decay and fungi develop. It's possible that this spawn fell victim to cold conditions, but it is more likely that this spawn was not fertilised. The pond has started to gain bit of colour (other than green and brown!) 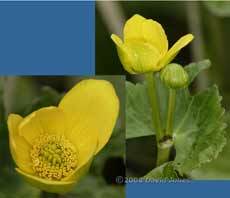 today as the first of numerous Marsh Marigold flower buds burst open, just two days earlier than in 2007, but still three weeks earlier than in 2006. 19 March - The pond has become a strangely quiet place, possibly down to the cold northerly wind that we are experiencing. This evening I spotted just one frog (in the small pond) and just three newts, with this the only one amongst the spawn, hunting tadpoles. In my last report I included the picture of dead spawn. While it is just that one clump that is dead, a casual look at the shallow end suggests that there are other groups of eggs in the same condition. 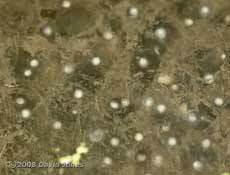 However, a closer look reveals that the white spots are actually pea cockles that have migrated up through the spawn, especially after dark. 20 March - Just a short note tonight. The weather isn't conducive to taking photographs, with enough of a breeze to make the water surface to rippled for photography. 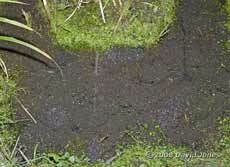 That was a pity because the temperature is around 9C at 8.30pm tonight and the newts are gathering to eat tadpoles. I could see twelve amongst the span a few minutes ago. 31 March - The end of a disappointing month as far as the frogs are concerned. 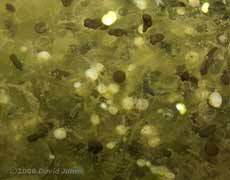 Their spawning seemed to be almost completely disrupted by the fluctuating weather, and we now have far fewer tadpoles than last year. 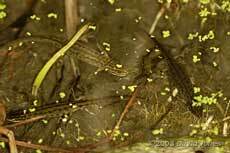 There also seem to be fewer newts, which is to the advantage of the tadpoles as less of them are being predated. I'm finding it difficult to keep three separate diaries on the go, especially with the nesting season starting to get busy, so while I intend to continue following progress in the pond though the rest of the year I'm going to do so within the garden diary from April onwards.